Fine Art Photography Prints by Ian Bramham: Landscape Photography Tips - "The Photographer's Ephemeris"
A review of a great desktop programme and smartphone 'app' for all landscape photographers. I've been using "The Photographer's Ephemeris" or "TPE" since it was first released in 2009. It is a really great resource for all landscape photographers and I thoroughly recommend it! Basically it's a programme that predicts the sunrise/sunset times and moonrise/moonset times and overlays that information onto a map. The desktop edition is available to download for free from their website and there are ios and android smartphone app versions available for a few pounds. TPE has lovely clear and simple graphics which make it very easy for photographers to know where they will need to be in order to stand a chance of catching the best light. The desktop version of TPE is really great for advance planning and for exploring possible locations for future photography trips but it's the smartphone and ipad 'app' version that I personally find the most useful. 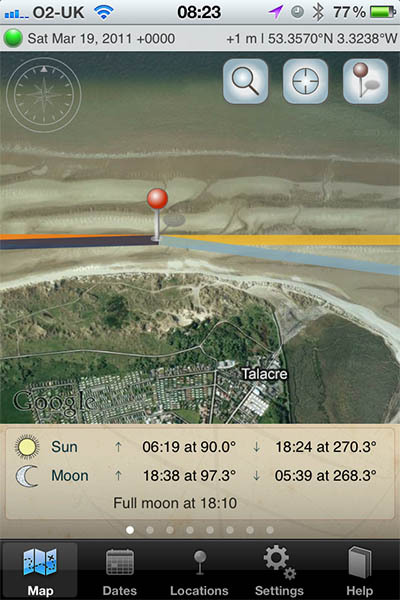 The screenshot below is from my iphone 4 and relates to the ephemeris data from a shoot I did on March 19th 2011 next to the famous lighthouse on the beach at Talacre in north Wales - the one you can see in the photo at the bottom of this article. You can see from the screenshot from my iphone that 4 coloured lines are superimposed over a detailed map of the area. Those of you familiar with GPS enabled smartphone apps which use maps like this will know that you can easily move the map about and zoom in and out. The icons on the top of the screen allow to you to do a location search, show your exact GPS location on the map and change the red map pin location. The red location pin can also be dragged across the map using your phone's touch screen. The "Dates" tab at the bottom of the screen allows you to select any date in the past or future and the "Locations" tab lets you store a series of map pin positions in advance of a planned photography trip. The 2 orange and yellow lines skow the direction of sunrise and sunset and the 2 blue and grey lines show the moonrise and moonset. There's much more you can do with the TPE map when you really go into it in detail - for example, for those of you who live in mountainous areas where sunrise and sunset times can vary according to the height of surrounding terrain, TPE will allow you to automatically input geodetic data using a secondary map pin which then allows you to see when the rising sun will crest the ridges of nearby mountain ranges. On the screenshot the TPE's red pin location is next to the lighthouse on the beach at Talacre and you'll see from the screen information that it's showing that there will be a full moon rising at 18.38 which is just 14 minutes after the indicated sunset time. I don't know how many of you remember all the fuss in the press at the time, but the evening of this particular day, March 19th 2011, was the night of the famous supermoon when the full moon was at it's closest to Earth. 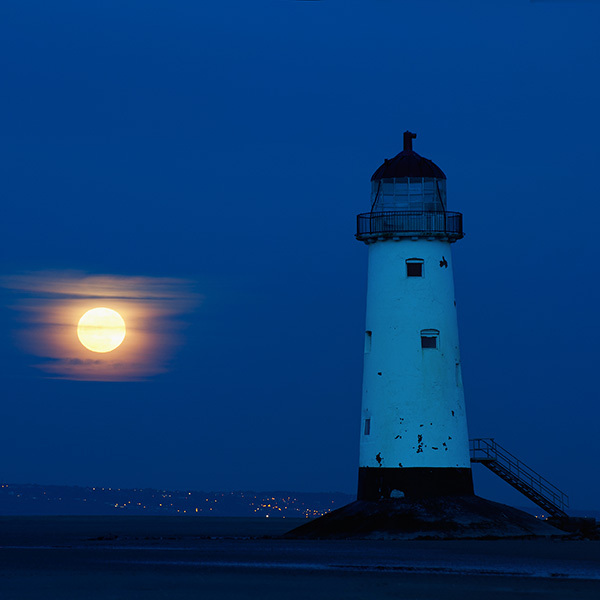 It was an incredibly impressive sight and, from the location shown on the TPE map, I managed to get the photograph you see below with the moon rising up over the Wirral peninsula with the lighthouse in the foreground. I hope that I've given you an idea of just how useful this TPE app can be for the landscape photographer - I think it's a brilliant bit of software and wouldn't be without it on my smartphone!